Crispy, buttery mashed potato topping. Oh yes. In Britain, fish pie is one of those recipes. The country is, relatively speaking, a small collection of islands, and the fish and seafood of the North Sea are a cornerstone of our culinary heritage. Combine that with a climate befitting a nation at the same latitude as Greenland, and you’ve got a perfect environment for the cultivation of such dishes as cod and chips (don’t call them fries! ), parceled salmon, and fish pies. Of course, everyone has their own notion of what makes the best fish pie. What kind of fish should be used? Ought it have cheese? What about boiled eggs? Pastry or potato crust? You’ll get as many different answers as there are fish in the sea. And there’s an extra complication when adapting the dish in the US, because whether you’re on the West Coast, the East Coast, or somewhere in-between, the kinds of fish you’ll have access to are going to be a little different. You can go crazy with your fish combinations, but here are the general guidelines. For the backbone of the pie, you want a firm white fish that holds its shape in cooking, but that will break into flaky pieces with a fork. This is traditionally cod – Atlantic cod are available to the North Sea fishing industry that feeds the UK, but Pacific cod will be the variety available to the west coast of the US. You can also use hake, halibut, or Alaska pollock. It all depends what’s fresh, available, affordable, and sustainable, and your best friend in this decision will be your supplier – the seafood store or fish counter at the grocery. You can also keep an eye on Seafood Watch to help you make sustainability choices: right now, farmed Atlantic cod is a safe buy, but that doesn’t mean you shouldn’t cast your net wider afield to try the alternatives. 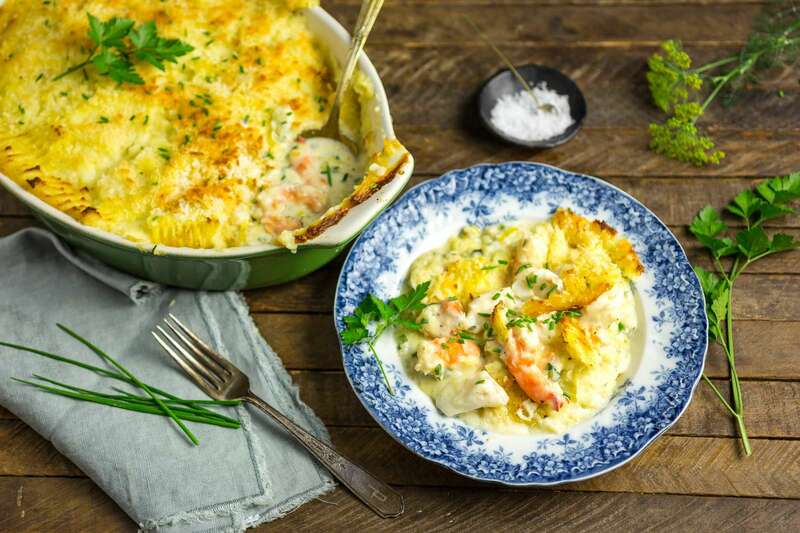 We’ve made this fish pie with many of the white fish options above, but this time around we used a combination of wild Atlantic cod and haddock which our friends at Sizzlefish were kind enough to send over to us. Their fish is sent already-portioned, frozen and vacuum-packed and was a perfect fit for this fish pie. They have a great selection of both wild and farmed seafood, and offer different subscription packages – please do check them out! 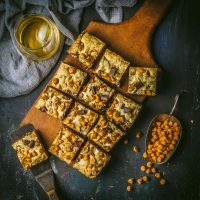 Cod and similar fish are generally mild, so you need to combine it with fish that adds a little richness and flavor, and often this role is filled by two different fish – salmon, and a smoked fish such as mackerel. 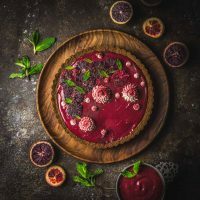 You can go pretty wild with the combinations of fish in this pie, but we wanted to keep it as simple and affordable as possible by combining those two rich-tasting fish into one. So if there’s one step we recommend you do at home to give the fish pie a real kick of intensity, it is this: hot-smoke your own salmon. Hot-smoked salmon isn’t like the cold-smoked sliced stuff that you would use to adorn a bagel. 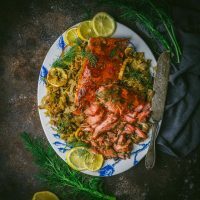 You can certainly buy it (usually to be found in the refrigerated section of the store with other pickled and cured fish) but it’s cheaper, and so easy, to make your own from a fresh salmon fillet. The first thing we’re going to partially cure the salmon. Fully curing the fish – a process that enhances the flavor and aids in preservation – can take several days if you’re thorough, but we just want to prime the outside layers of the fish for the smoking process, and infuse a little flavor at the same time. Sitting the fish overnight (or for a day) in a rub of salt, sugar, mustard powder and lemon zest will do just the trick. You’ll notice that the process dramatically changes the color of the salmon, from its initial pink to a deeper red, even after just a few hours. Once you’re ready to smoke, wipe most of the rub off the fish, but don’t rinse it. You can use a smoker, if you have one, but this process works just as well on a charcoal grill. All you need is a foil pan of water and soaked wood chips (you can also use wood cooking pellets in a foil pouch). Most types of wood work fine, but we avoid mesquite which tends to overpower all the delicate flavors in the pie. 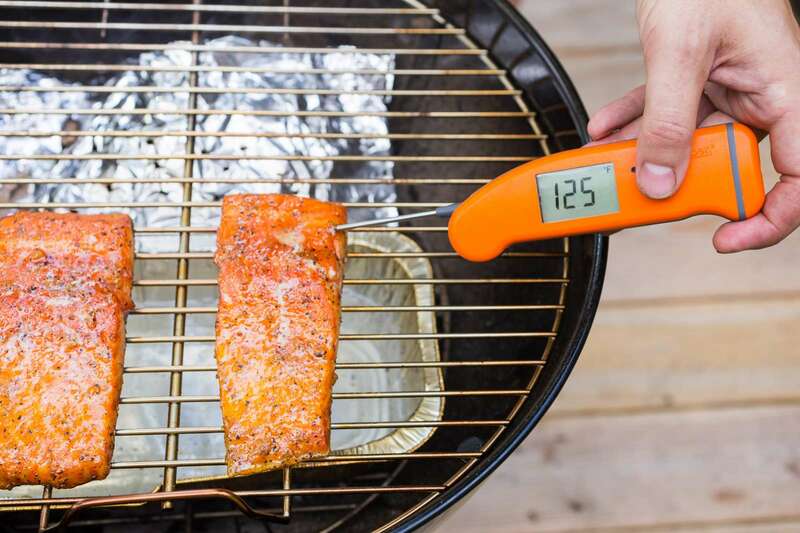 Cooking with smoke is a slower process than straight grilling, but we still want the inside of the fish to cook to medium rare, so we’re looking for 125 degrees as an interior temperature on a quick-read thermometer. 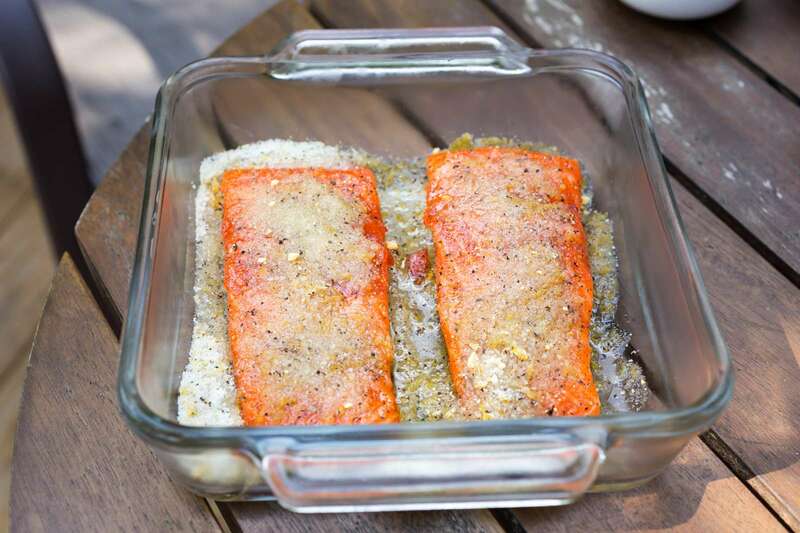 Once you get there, you can remove the fish from the grate and cover it tightly in foil – it will continue to cook a little and should reach the medium-doneness which will allow it to flake easily. Allow it to rest for half an hour before breaking into chunks. 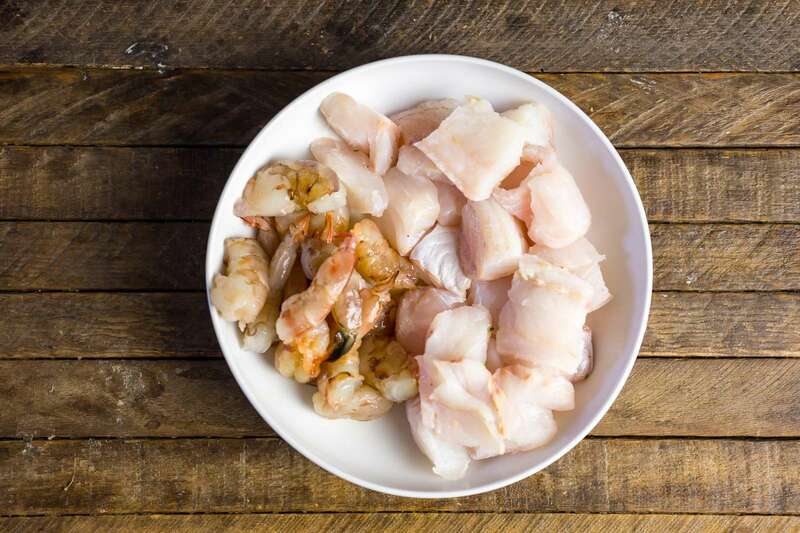 We do add a third seafood to the fish pie to mix up the texture a little, and our preference here is for shrimp. 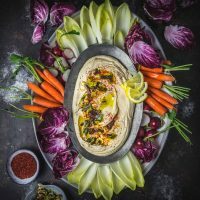 Because it cooks quickly, you don’t want to use a small variety and risk overcooked or rubbery lumps: opt for medium or large, and if you find extra-large or jumbo, these will work well cut into slightly larger than bite-size pieces. We do take one extra step with the shrimp after they’re cleaned but before cutting up: briefly soak in a brine of salt and baking soda. This only needs 15 minutes but does wonders to keep the shrimp moist in the cooking process. 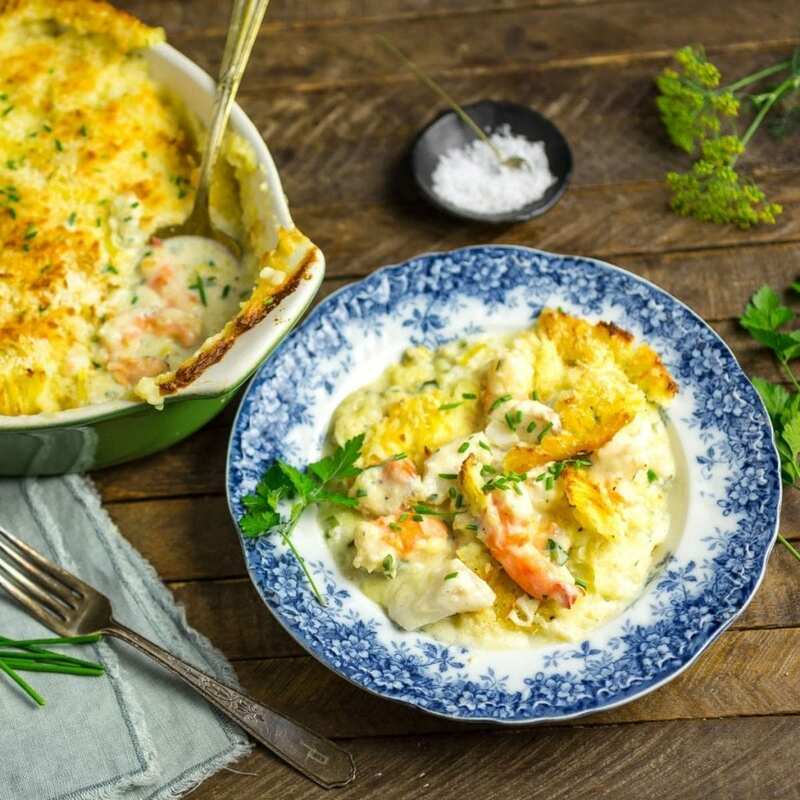 The filling of the fish pie is essentially a leek, parsley and cream sauce that adds an oniony richness, but is mild enough to let the fish shine through. You could use actual onions, but we prefer leeks as they pair really well with the more assertive seafood. 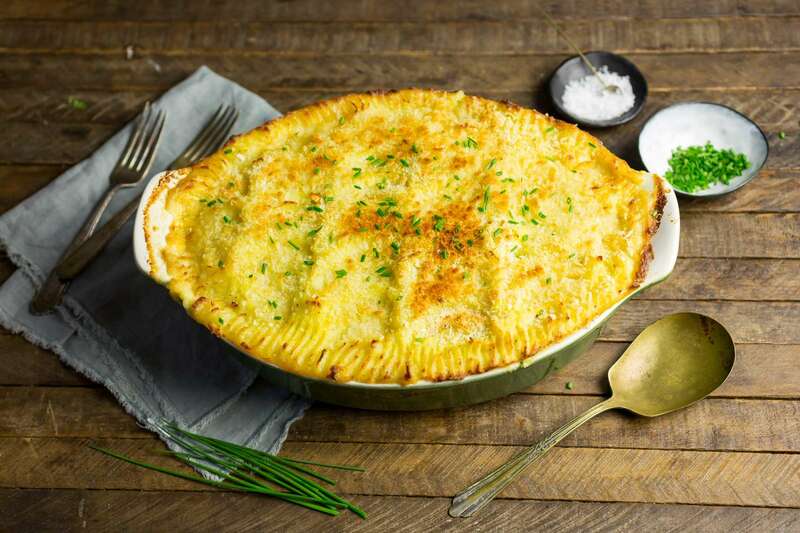 As to the pie crust, you could definitely go with a puff-pastry version, and we’ve had some great pastry-topped fish pies, but for this version we’re going with easy and simple mashed potato. We want the crust to remain stable, so we use this recipe for fluffy mash, but hold back a little of the liquid. To get that essential brown, crunchy top, we used a few dabs of butter and some sprinkled panko. You could also add a little scattered parmesan or romano cheese. 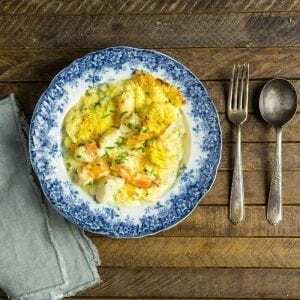 America and Britain may be two countries separated by a common language, but as this fish pie recipe goes to prove, we’re fed by the same oceans. We’re not claiming this to be the definitive fish pie, but if it’ll help keep the Special Relationship going, we’ll be satisfied enough with that. Combine the sugar, salt, pepper, mustard powder and lemon zest in a small bowl. Place the salmon, skin-side down in a glass dish. Spread the mixture evenly on top of the salmon. Cover the dish with plastic wrap and refrigerate for at least 4 hours or up to 12. If using wood chips, soak them in water for at least 1½ hours before you plan to smoke the fish. (Pellets do not have to be soaked.) Light one chimney full of charcoal. When all the charcoal is lit and covered with gray ash, pour out and arrange the coals on one side of the charcoal grate. Sprinkle half the soaked wood chips over the hot coals. You can also use a smoker box or a foil packet with holes punched in it. On the empty side of the grill, place the foil pan and pour in 1 cup water. Place the cooking grate on the grill. Make sure top and bottom vents are open about ¼ of the way. Wipe most of the sugar mixture off the salmon place the fish, skin-side down, on the cooler side of the grill directly over the foil pan. Close the lid on the grill and smoke the salmon for about 20 minutes. The interior of the fish should reach 125ºF on a instant thermometer and feel just firm to the touch. Transfer the salmon to a plate and cover with aluminum foil. Allow to rest for at least 20 minutes. When cool, remove skin and any bones, and flake into medium (1 inch) pieces. Peel potatoes and cut into rough chunks, about 1 to 2 inches cubed. Transfer to a bowl of cold water to rinse. Change water 2 or 3 times until it runs clear. In a Dutch oven or large stockpot, bring 4 quarts of water to a boil over high heat. Add potatoes and cook until completely tender, about 15 minutes. Drain potatoes in a colander and rinse under hot running water for 30 seconds to wash away excess starch. Set a ricer or food mill over now-empty pot and pass potatoes through. Add milk and butter and fold gently with a rubber spatula to combine. Season to taste with salt and pepper. Keep warm until ready to serve. Heat the oven to 375°F and arrange a rack in the middle. In a medium bowl, toss shrimp with ½ teaspoon kosher salt and ⅛ teaspoon baking powder. Place in the fridge for 15 minutes or up to an hour. When ready, cut into large chunks if extra large or jumbo. In a large saucepan over medium heat, melt 4 tablespoons butter. Add the leeks and cook until soft but not brown, about 5 minutes. Stir in flour and cook for 2 minutes. Slowly add the wine, milk and cream, stirring well. Bring sauce to a simmer and cook for 5 minutes. Stir in the parsley, chives and anchovies. Remove from the heat and season to taste with salt and pepper. Gently stir in the smoked salmon, cod and shrimp. Transfer the mixture into a buttered 2-quart baking dish. Top with dollops of mashed potatoes, then use a spatula to spread into an even layer over the entire top of the dish. Make sure to cover the edges to prevent sauce from bubbling over. If desired, use the back of a large spoon to create a wavy texture. Sprinkle over panko breadcrumbs and and dot top with the remaining 2 tablespoons of butter. Place dish on a baking tray and place in oven on center rack. Bake until bubbly and the top is golden brown, about 30 to 40 minutes.